Building your own home or remodeling the home you bought on Roatan can be an enjoyable, frustrating, fun, patience teaching, learning flexibility experience that you will never forget. It definitely is counted as “paying your dues” to living on Roatan. You will meet different people who will help you find those particular items that will make your home unique. The following is a list of items you will need to determine before engaging a contractor. Consider your ongoing costs of maintenance, insurance, mold and sea spray in making your determinations. The number one thing you must know is: There are no Construction Codes, and no inspections for any construction, plumbing, or electrical work. Be very sure you select contractors with the highest proven skill level. 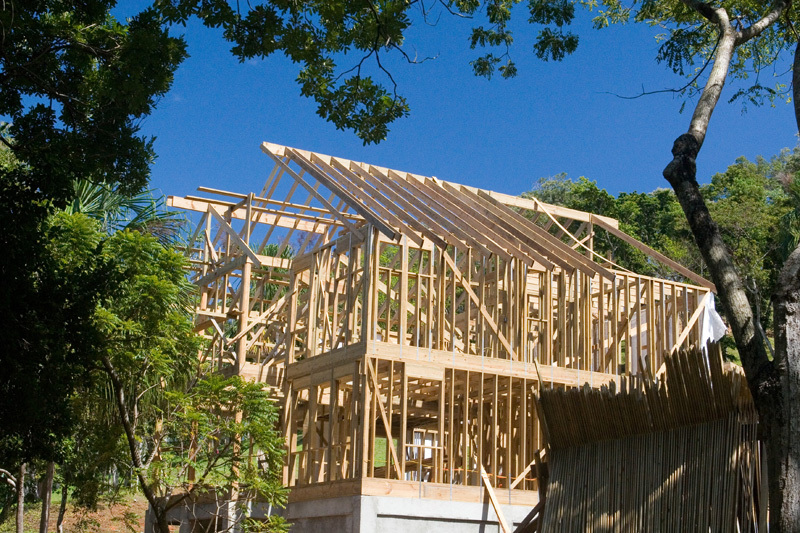 One of the first decisions you’ll have to make concerning your new home is the type of structure you want to build and live in, and if you prefer to build with wood or concrete. While concrete structures don’t get termites, are stronger and usually last longer, wood structures do look nice and if they are treated on a yearly basis for pests, can last forever. After you’ve bought property for your new home and decided on the type of structure you want, the next step in the building process is hiring an architect. While some people would rather avoid this step and design their new home themselves, or utilize an online home design company, many builders recommend using a local architect. There are several advantages to using a local architect. Foremost is the fact that a local architect is able to view the property firsthand and design your home in accordance with the topography of the land. If you use a foreign architect, it is imperative you provide the architect with as much information as possible concerning the building site and thus obtain the best design possible. Another advantage to hiring a local architect is the requirement that all building plans in Honduras must be signed and stamped by an architect or engineer registered in Honduras in order to obtain a building permit. If you hire a local architect, the building plans he/she provides to you with will include the signature and stamp. If you hire a foreign architect or purchase plans from some other source, these still need to be signed and sealed by a local architect or engineer to obtain a building permit. In most cases your builder can get a local architect’s or engineer’s approval, signature and stamp. The cost to get your foreign designed plans approved and stamped by a local engineer or architect ranges from $200 to $500. For more on Living in Roatan we recommend the Roatan Relocation Guide. The guide supplies you with the insiders information necessary for you to make an informed decision about Investing and Living in the Bay Islands of Honduras. A must have guidebook for any one considering relocating, living or investing in real estate in Roatan, Utila, Guanaja or La Ceiba.